I just wanted to know if you have a PayPal set up where I could donate money for you making this app. @Baconbitz thanks for the kind words, but I do not require payment. All I ask is that you evangelize the app and tell everyone to use it and talk about it. It is almost impossible today to compete against marketing dollars on the app store, and that is unfortunate. Seeing so many flashlight apps ripping off the users who don't know any better is quite enraging. I was wondering if you have an android app? I just switched from ios to android and can't find anything close to your app. If you don't, do you plan to? Know of anything comparable? Thanks a lot. I don't have an Android phone, but if I do acquire one at some point, I'll gladly port it. In the meantime, I'm waiting for iOS 7 and I'll update the UI accordingly. IOS 7 ships with a flashlight accessible without unlocking the phone. 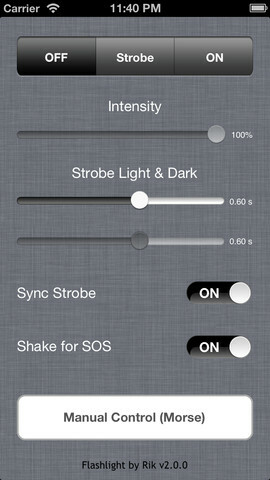 It doesn't appear to have all the goodies your app has, like intensity control and strobing. It's on the lock page, swipe from the bottom up for the tools page, bottom left of tools page. This works great on my iPod, but when I search the App Store with my iPad, I can't access the app. It doesn't even show up. I downloaded and installed the app on my iPod and it works great. However when I tried with my iPad, the App Store didn't show the app. A search on both app and developer gave " no results". @Ruthie: Any device that has a LED light in the rear will be able to download the app. 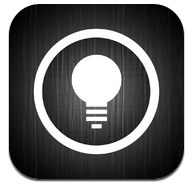 Unfortunately iPads do not have a LED "flash", so the app can't work on them. That's why you don't see the app on the iPad store. Outstanding application. When many others are making it more complicated than it needs to be, This one has most of all the others combined but in a user friendly look and feel. no ads are the deciding factor in keeping this one. Could you fix the UI problems on iOS 8.3? Thank you for your time and effort. I don't know if you're accepting suggestions, but if so then you may consider adding an option to use the screen instead of the flash. An all white screen creates a very gentle glow that is very pleasing to read by. A sleep timer would also be amazing. With or without, I will definitely recommend the app every chance I get. iOS 8.3 issues have been fixed. Thank you Apple for changing the UI colors without notifying us. Bad Apple. Bad! An all white screen and sleep timers are great ideas. I'll implement them as soon as I can. Thank you! Hello and thank you for this wonderful application. I was wondering, and if this app is indeed still under further development that perhaps you could consider a long press of about 1/3 of a second can be implemented for the push/sliders toggle/buttons so that accidental changes are avoided while multi tasking. Thanks @unavailable but to avoid unwanted touches there's already the option of darkening the screen, effectively locking changes.